Get ready for the spookiest Halloween! 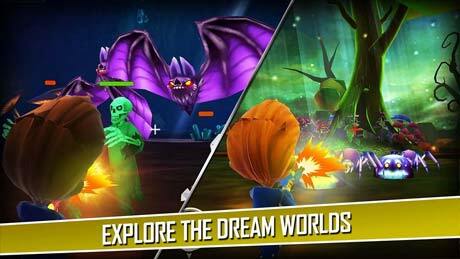 Join Little Ray – our war hero who is determined to bring down the master of the menacing army of ruthless minions. Download Spooky Realm now! A free action packed 3D game where you take command of our hero Little Ray’s life and help him rescue his grandma from Boogeyman’s dungeon. With little Ray, enter his spooky dreamworld and travel to the most eerily haunted places as you move from level to another, and unlock the spooky worlds that belong to the dark kingdom. Discover a dirty swamp, which looks like a candy land but is infested with ghouls and ghostly creatures. Chase the spider army in the deserted barnyard filled with creepy crawlers, bats, pumpkin heads and finally enter the bone-chilling crystal mine, where the only ray of light is from bright snow like crystals and lakes of molten lava! Do you have the courage to take down the legendary dark army of creepy crawlers, pumpkin heads, skullies, spiders, mini zombies, freaky jokers & clowns? Are you ready to clash with the legends like the pharaohs, little frankie, saw champ and the magical and powerful lich? Equip yourself with exciting armor in this minigame of mini creatures & minions. They attack with their lethal claws, floating stone, spells, saws, judo chops and poisonous bullets. Spooky Realm is scarier than dino land. These tiny creatures are terrifyingly deadly and dangerous. Their hideous laughs will send shivers down your spine. 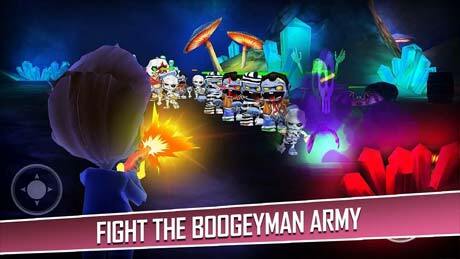 Your mission is to fight the spooky army and take down their bosses. Like every army base, these ghouls and demons have a boss in every level. Do not underestimate their fighting skills as every attack of these mini beasts brings down your health. Beware! The jokers are not here to make you laugh. Their potty paper attacks are too lethal and the giant pumpkin heads pack a wicked punch. Choose from a variety of toy like weapons shaped like rifles, sniper & shotguns. 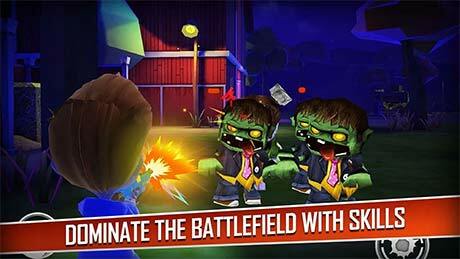 Earn experience by killing the mini beasts and earn gold coins on winning the battle and moving to the next level. Earn daily rewards and unlock treasure chests. Move up on the leaderboard and record your game to share it later with friends and challenge them to fight through the dark war. This videogame will change the way you dream. It is a game intended for all ages, for kids and adults. Cute 3d graphics, spooky music, variety of weird, nightmarish & horrific creatures, fast-paced storyline & great gameplay, unusual weapons with different shooting effects, make Spooky Realm one hell of a game! Everyone, Fighting has never been so much fun. This Halloween call on spooky realm!